Vecna Robotics, a leader in intelligent, next-generation, robotic material handling autonomous ground vehicles (AGVs), was awarded first place in the DHL & Dell Robotics Mobile Picking Challenge 2017. The event was held last week at the DHL Innovation Center in Troisdorf, Germany. The challenge required a mobile robot capable of navigating traditional warehouse shelves, and picking boxes and totes. Vecna Robotics’ Tote Retrieval System (TRS) was not only able to successfully pick the boxes from different levels of the shelf but also was able to place the boxes and totes on its autonomous RC20 Conveyer (20kg) mobile robot. The challenge provided the perfect platform for Vecna Robotics to fully test and demonstrate the Tote Retrieval System’s capabilities. The TRS was engineered to autonomously navigate down narrow aisles, and place or retrieve cases, totes or other items from shelving. The system also is capable of picking from or placing on conveyor belts or other mobile robots. The system identifies items by reading barcodes on the shelved boxes. With an optional 3D vision system, the TRS can pick unlabeled boxes, as well. TRS can be used in goods-to-person or goods-to-robot order fulfillment activities, case retrieval for order fulfillment, lineside replenishment or numerous other activities. Vecna Robotics’ TRS was designed to integrate with a warehouse management system (WMS) to retrieve and store items as needed to support warehouse operations. As with all systems within Vecna Robotics’ next-generation fleet of mobile robots, the TRS is designed to operate safely around humans, preventing the need to separate human and robotic order fulfillment activities into different parts of the warehouse. This level of intelligent autonomy allows for maximum flexibility and robustness, Theobald said. While Vecna Robotics is making the system available for pre-orders, general availability will occur mid-2018. “We look forward to implementing this solution in the world’s largest manufacturing, shipping and retail order fulfillment facilities,” Theobald said. 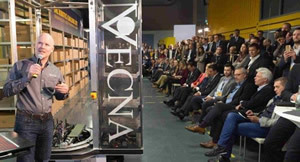 The outcome of the DHL challenge follows Vecna Robotics successful spring launch of its reliable, safe and cost-effective fleet of material handling mobile robots. Manufacturers, retailers and shippers ranging from Fortune 50s to SMEs are turning to Vecna Robotics to move boxes, totes, cases, carts, shelves, bins, dunnage, pallets, and heavy, oversized SKUs. The fleet is integrated with Vecna Robotics’ proprietary and revolutionary IIoT (Industrial Internet of Things) Remote Assist software. Companies using Vecna Robotics’ technologies are gaining an operational advantage and a rapid return on their investments. For more information about the Tote Retrieval System contact Vecna Robotics at info@vecna.com. Vecna Robotics offers a fleet of intelligent, next-generation robotic autonomous vehicles (AGVs) to optimize logistics and material handling operations. Vecna Robotics has two decades of experience developing advanced systems for medical and military operations and its case picking, goods-to-person, person-to-goods, robot-conveyor hybrid material handling systems are the most cost-effective in the market. Vecna Robotics is helping companies reduce costs, improve throughput and stay flexible and competitive.